Robert Uzzo, MD, FACS, Chair of the Department of Surgical Oncology at Fox Chase Cancer Center, is the recipient of the President’s Distinguished Service Award from the Society of Urologic Oncology (SUO). 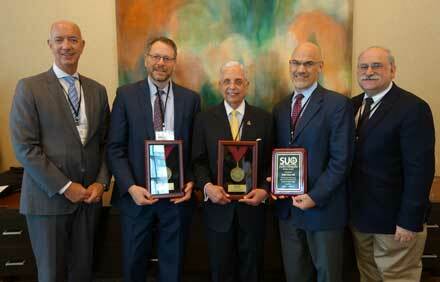 The award was presented at the American Urology Association’s annual meeting in Boston in May. The Distinguished Service Award is presented to a urologist whose actions at work or in the community exceed job expectations and reflect values of compassion, respect, trust, commitment to excellence, and teamwork, as well as educate the community about prostate cancer. The SUO’s board of directors provides nominations for the award to its awards committee. The committee then ranks all nominations and provides the top three back to the board for a vote. The board then votes to determine the winner. Internationally known as a leader in the field of urologic oncology, Uzzo has made important clinical, scientific, and educational contributions to the Department of Surgical Oncology. A fellow of the American College of Surgeons, Uzzo has consistently ranked among Castle Connolly’s and Philadelphia magazine's "Top Docs" in urology. He is a national principal investigator for a clinical trial by the Eastern Cooperative Oncology Group to evaluate new, targeted therapies for kidney cancers, and immunotherapy. He is the author of more than 350 chapters, articles, books, and abstracts on urologic tumors, and has presented hundreds of regional, national, and international lectures. In addition to his extensive clinical practice, he oversees research laboratory initiatives studying molecular mechanisms of genitourinary cancers.